When selecting the location of the FRP biogas tank, it is better to use the biogas kitchen within 30 meters to avoid the air pressure. The “three combinations” should be realized as much as possible, that is, the biogas pool, the toilet, and the pigsty are three-in-one, which makes it easier to enter and exit. At the same time, it can achieve better results. 1. Dig the pit at the selected construction pool. The diameter of the upper mouth of the pit can be dug larger to facilitate the placement of the biogas tank into the pit. The bottom of the pit is dug into the same shape as the bottom of the FRP biogas tank. Between the feed pipe and the water pressure, the pit can directly dig according to its shape and size. 2. When digging a pit, if there are holes, stones or partial landslides at the bottom, it should be disposed of in time. 3. After digging the pit, check it with a tape measure. If there is a gap in the size of the specification, it should be repaired in time. 1. Before installing the FRP biogas tank, carefully check whether there is any damage to the appearance of the biogas. Once it is found, repair it in time before proceeding with the installation. 2. Before assembly, remove the debris and sludge from the joints of the upper and lower pools and sand them with sandpaper. Align the upper and lower halves of the pool mark, and then put them in place after the anastomosis. 3. Stir the binder liquid thoroughly and use a spatula to even wipe it in the groove of the joint between the upper and lower halves. The remaining material is directly filled with water pressure and feed pipe. 4. Connect with M10 bolts. Operate diagonally when tightening bolts. 5. The secondary solution is thoroughly stirred and then evenly poured into the grooves of the joints of the upper and lower chambers. 6. Before connecting the inlet port and the water pressure to the main cell body, first, perform a test installation to check whether the screw eye can be completely matched. Then, the remaining material described in the three items is evenly applied to the joint portion and screwed with a screw. 7. Before preparing to put the pool, first, fill a layer of fine loose soil about 40mm thick at the bottom of the pit, and fill the thick part of the curved part of the bottom of the pool. 8. 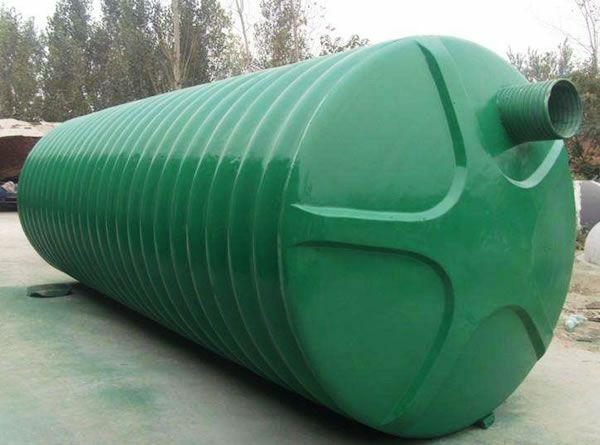 After assembling the FRP biogas tank, place two solid kinds of wood on the pit, lift the biogas tank to the timber, and then borrow the manual hoist to put the biogas tank into the pit. 9. After the backfilling is completed, install the movable cover, and bond the movable cover and the main pool body with hard clay with good viscosity. Then tighten the back bolt and inject water. 1. The assembled FRP biogas tank is slowly placed in the pit, backfilled with fine loose soil and sand, watered while filling, and then backfilled with the wooden stick. 2. In areas with high groundwater levels, water can be added to the pool at the same time, to half of the volume. When the backfill is tight, do not use wooden sticks or other tools to hit the biogas tank to avoid damage to the pool. Next : What is the difference between alkali and alkali in FRP Pipe?